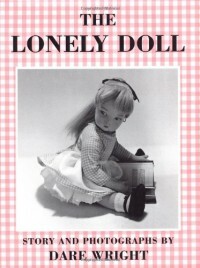 Never read The Lonely Doll as a kid, somehow acquired a biography of Dare Wright (still unread), saw this displayed in the kiddie section at the library and snatched it up. I read it this morning because I needed to take it back to the library. This is a children's book that involves a story, told through photographs, of a doll who is desperate for friends until one day two bears mysteriously show up. There's a large bear who ends up being a father figure and a little bear who ends up being the doll's partner in crime. The text is simple and brief and the photographs are dreamy black-and-white shots. I think as a kid I would have thought it was just a cute story and been inspired to tell a similar story with my dolls, but as an adult I found it terribly sad and a little creepy. (And it would be creepy even without the oft-mentioned spanking scene.) It's pretty, though.